The Benefits of Renting Uniforms for Food Service Employees | Ace Uniform Services, Inc.
Why are uniforms perfect for those in food service? Learn below! Uniform rental is one of the single best ways to make your employees appear more professional, more knowledgeable, and like they’re a perfect fit for your workplace—in every industry. 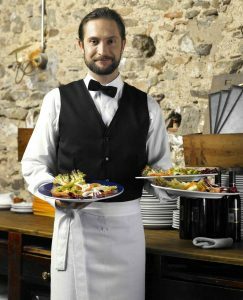 Food service uniform rental is particularly helpful, as restaurant and catering company employees are under top pressure to look as clean and professional as possible. Here are some of the top benefits of renting uniforms for food service employees. Many businesses who rely on their employees to provide multiple items of clothing suffer as a result, since every employee brings in a slightly different shade of black pants or red polo shirts and your business’s image suffers as a result. Food service uniform rental ensures that all of your employees, including chefs, line cooks, and butchers, will match on the job. Ace Uniform provides a comprehensive range of restaurant uniforms to match your logo and company colors if needed. Food service is all about maintaining impeccable standards of hygiene throughout food preparation. Even if your food service employees maintain the highest standards throughout the actual food preparation process, customers will doubt the quality and cleanliness of your establishment if the employees appear dirty or unkempt. Food service uniform rental makes sure that your employees always look put together and clean, as we can take care of properly laundering them as well. Every business owner has experienced the employee who suddenly doesn’t know where a crucial component of their uniform is. If you regularly encounter missing uniform parts, renting uniforms for your food service employees and keeping them on-site will ensure that nothing walks off or gets misplaced. Every shift, your employees will have clean and crisp complete uniforms to put on. Play best y8 games at the website. Y8 games online play this games, relax, have fun. To give your restaurant or food service business a clean, professional, and cohesive look, rely on Ace Uniform. Whether you need uniforms in the food, automotive, industrial, construction, medical, security, or you-name-it industry, we can provide you with the uniforms you need for the price you want. Give us a call at 1-800-366-1616 or visit us online to learn how we can help meet your needs. Want to get to know us even better? Visit us on social media on Facebook, Pinterest, Twitter, LinkedIn, and Google+. This entry was posted on Thursday, March 23rd, 2017	at 10:36 am	. You can follow any responses to this entry through the RSS 2.0	feed. Both comments and pings are currently closed.